Rating: 4.5/10. From 81 votes. 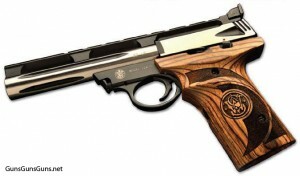 Summary: The description, specs, photo and MSRP for the Smith & Wesson 22A Deluxe pistol. The Smith & Wesson (S&W) 22A Deluxe is an upgraded version of S&W’s 22A semiauto pistol designed for TALO Distributors to address the market for a serious target gun at a reasonable price. It’s on an aluminum alloy frame with a stainless steel slide. Features include a steel trigger with an adjustable overtravel stop, a grip upgrade that includes custom textured wood and a more pronounced thumb-rest, a fluted bull barrel, improved adjustable sights and a racy new look. .22 LR 10+1 5.5″ 10.5″ n/a n/a 35.5 oz. This entry was posted in .22 LR, $251-$500, $501-$750, Full size, Semiauto, Smith & Wesson, Talo on May 4, 2011 by Staff.